Does your favorite watch look worn and in need of a little care and maintenance? Many watches are worn every day, and exposed to dirt, moisture, or just everyday wear and tear. Here at MJR, we perform watch band replacement and repair services every day. Let us help you make your timepiece look spectacular again! 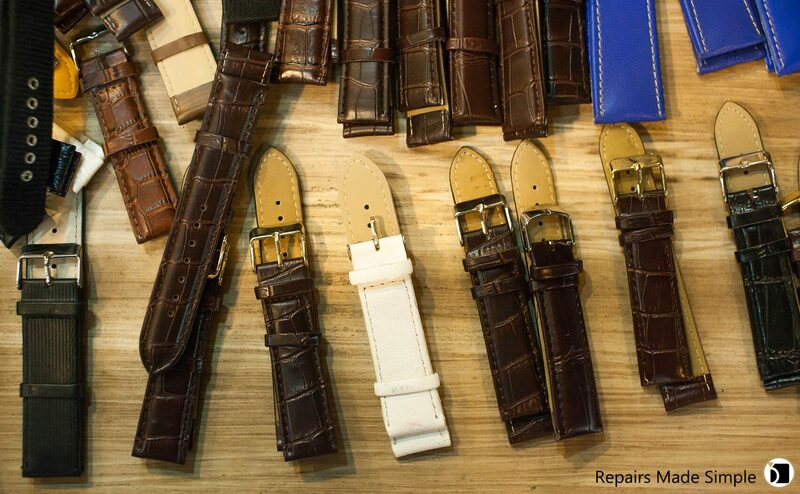 Replacing a worn watch band can make your watch look like new. For a current watch style, we are usually able to replace it with an original band ordered from the watch manufacturer. If an original is not available, we can replace it with a similar band. In many cases, a damaged metal band can be repaired instead of replaced. We work with almost every watch manufacturer in the industry ordering original parts including clasps, buckles, pins, and other parts needed. If a band cannot be repaired or parts are not available, the band may need to be completely replaced. This service can really transform a watch that is worn and scratched to looking like new. Stainless Steel and Solid Gold bands and cases can be cleaned and polished to remove most surface scratches. Some bands and cases have a brushed finish, and the brushed finish can be reapplied after the polishing process. All of these services can help you protect the financial and/or sentimental value of your watch. Remember, not all watches require repair, but all watches require routine care and maintenance. If you would like to place a watch band replacement or repair order, please click on the "Get Started" button below. MyJewelryRepair.com is the premier choice for Jewelry & Watch Repairs in the United States. Our online service is available nationwide with Free Standard Shipping.